Self-supporting towers are supported on ground or on building and they act as cantilever trusses in carrying the wind and seismic loads. Though the weight of these towers is more they require less base area and are suitable in many situations. 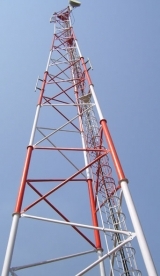 Hence most of the Telecom Cell Towers are self-supporting towers. Steel towers can be constructed in number of ways but most efficient use of material is achieved by using open steel lattice. The use of an open lattice avoids presenting the full width of structure to the wind but enables the construction of extremely light in weight and stiff structures. Hence most of the Telecom Cell structures are lattice structures. “POWER” is the key infrastructural ingredient in the countries economic growth. Recognizing this as an area of current and future growth, the company has created a separate “Power Pylon Division”, for the turnkey construction of 66-KV, 132-KV, 220-KV, 400-KV transmission lines and sub-station structures. As a Turnkey Transmission Line specialists, we are capable of developing and drafting tower drawings, site surveys and right-of-way studies, fabricating and hot-dip galvanizing towers, constructing tower foundations, erecting lattice structures and stringing conductors. Our crews are well trained and highly productive. We have a complete set of erection and stringing tools required to complete a single circuit or double circuit line. This division is managed by capable and experienced engineers, who have been in the business of commissioning. The division takes pride in quality, on time, and safe construction. All employees are trained in safety procedures, and given regular instructions in current erection procedures and practices.